Even with Lenín Moreno's presidential victory, the Ecuadorian left is in dire need of reconstruction. In the second round of presidential elections in Ecuador on Sunday, April 2, Rafael Correa’s successor as leader of Alianza País (Country Alliance, AP), Lenín Moreno, won 51.6 percent of the vote, defeating conservative Guillermo Lasso, who took 48.8 percent. What is the significance of these elections, ten years after Correa first assumed office? Decio Machado, born in Brazil in 1968, was an adviser to Correa during his first term (2007–9), and has been one of the sharpest observers of Ecuador’s politics during the ten years of Correa’s rule. Machado is a founding member of the editorial board of the Spanish website Diagonal . He is an associate researcher in Sistemas Integrados de Análisis Socioeconómico and director of the Fundación Alternativas Latinoamericanas de Desarrollo Humano y Estudios Antropológicos (ALDHEA). He is coauthor, with Raúl Zibechi, of Cambiar el mundo desde arriba: Los límites del progresismo (2016). Machado spoke to Felipe Pineda Ruiz of Democracia en la red , following the second round of presidential elections. How do you interpret the electoral process of April 2? We’re living through a complex situation. If it is clear that Alianza País won the elections and will prolong its period in power, with new leadership other than Rafael Correa, it is also evident that the social and economic situation of the country is complicated. The lack of liquidity facing the state will make it difficult in the short term to deal with the policies of aggressive internal and external indebtedness carried out during the last term of Correa, while the electoral period has resulted in a sharp level of social polarization that is beginning to show some troubling similarities with what is happening in Venezuela. This is the difficult thing for the next government, and it remains to be seen what its capacities are in terms of revising the errors committed by officialism over the last decade, and positioning itself not as the inheritor of the immediate past, but rather as a new government with the capacity to confront the new challenges that lie ahead. We’ll see what happens. Alianza País, with all of its positives and negatives, has many things to rectify, and some have many doubts as to whether they have the will and capacity to do what is necessary. Do you thing that the protests by the right-wing party CREO after the elections, led by their presidential candidate Guillermo Lasso [against supposed electoral fraud] will have any concrete effect? Personally, I think they lack the militant muscle necessary to sustain a prolonged mobilization against recognizing the legitimacy of the electoral results. However, it’s a fact that large sectors of the country are unhappy with the electoral results and the aptitude for bad will on the part of the National Electoral Council does not do anything to help the situation. In the second round, as in the first round, when accusations of electoral fraud on the part of the opposition were sharpening, we saw that the website of the NEC itself was disabled. These are unpardonable errors for an institution that is under suspicion in wide sectors of Ecuadorian society. So circumstances will have to change a lot in current Ecuadorian politics, or the scenario will possibly be that the next government has a weak profile, one that is questioned as illegitimate, in a discursive strategy that will surely be articulated by the most reactionary sectors of the country. This in conjunction with the fact that Alianza País has become very unsexy for many Ecuadorians over the last several years, who are no longer enamored with the government’s platform. How do you interpret the electoral map that was consolidated in the election on Sunday? It’s too early to digest all of the dimensions of what happened on Sunday. Your question in concrete terms is complex and requires analysis that will likely be carried out by various researchers in the coming days. In any case, the results on Sunday reflect what had already been projected in the first round. Territories with a strong indigenous presence and with a high impact from extractive policies voted for the conservative candidate (Lasso), and officialism (Moreno) won in places that in the past had been in the hands of conservatives. A map that, in short, reflects the political complexity in which we are immersed at the moment in Ecuador. Is it possible to infer any pattern of electoral behavior by the middle classes? I still have not been able, in a detailed way, to analyze the Ecuadorian vote by social strata and specific populations. Still, it is worth pointing out that there exists a certain discourse among a set of regional supporters of progressivism that is very critical with respect to the middle classes. They understand the vote in Argentina, in Brazil, and now here in Ecuador, as a betrayal, or an act of ingratitude, with respect to governments that have developed public policies that have allowed a part of the popular sectors to be incorporated into the so-called middle classes. Personally, I don’t see it like this. It appears to me, rather, that this attitude reflects the incapacity of the techno-bureaucrats of progressivism to understand the new profile of social demands that have emerged through the process of modernization that has been unfolding in the region. Ecuador is no exception in this respect. Public administrators must comply with their obligations to providing the services needed by their citizens in their respective societies; if they are expecting gratitude from the governed, it is better that they dedicate themselves to making music in the street, or work for a charitable association. Do you think that Alianza País will reformulate their policies, or even better, radicalize them? I don’t think we are going to witness any radical change in the political process that the country has been living through. We were already promised this kind of change by President Correa in the 2013 elections, and instead we saw that the government was obliged, due to the economic conditions of the country, to enter into a logic of privatization and understandings reached with sectors of private capital. We haven’t yet seen the tip of the iceberg in this respect. I think Lenín Moreno is a man with a more tolerant mood, and he has expressed, during his electoral campaign, the will to dialogue with sectors that are critical of officialism. In that sense I think it’s possible that he will govern conflicts with the existing dissident politics of the social movements in a different way. Having said that, with respect to advancing toward a model of development that is not damaging to the environment, that decriminalizes abortion, that transcends a model of society marked by its patriarchal character, that understands that the capitalist mode of production and reproduction can be replaced by another model that is not so harmful to society, and many other things that must configure any program clearly of the Left — we’ll have to see. Among the Ecuadorian movement sectors, a priori, there is not much optimism in this respect. In any case, we will have to give the new government that is formed in May the benefit of the doubt. How do you interpret the support for Lasso from a diverse amalgam of sectors from the Left? From my point of view, after this electoral process, the political left in Ecuador no longer exists. With reference to the immediate past, what we had defined as progressivism today no longer represents what we had once wanted it to represent. Its evolution, through the logic of government associated with realpolitik, has led it to live together relatively comfortably with sectors of big capital and the transnational corporations that run the national economy. There is therefore a mismatch, which has become more evident over the years, between what progressivism is today and the inalienable values articulated in the history of social struggles led by the Left. It is enough to highlight how progressivism lacks any sense of class in the current moment, how it has forgotten debates linked to private property, over who controls the means of production, or how it has forgotten all references to real nationalization of the strategic sectors, or of the sectors that would develop its capacity to intervene in the public interest, among many other things that form part of the historical legacy and values of the Left. On the other hand, the Left of the left of governmental progressivism has also lost its political compass in Ecuador. Its current support for a political party that is the expression of the interests of national and international financial capital cannot be understood as anything other than the mortgaging of its political ideology in order to intensify the conflict with the current government. This opens up a new situation in Ecuador, insofar as it makes the necessity of rebuilding a left an urgent and fundamental task. However, this reconstruction must be done with new social sectors and a new political generation, possibly even projecting itself politically. All of this must depart from a fundamental debate, which is about what we understand the Left to be 228 years after the storming of the Bastille and the French Revolution; and what type of left Ecuador needs today, rooted in the social, economic, cultural, and political problems that the country is currently living through. Republished from Democracia en la Red . Decio Machado is a former adviser to Rafael Correa and a founding member of the editorial board of Diagonal . 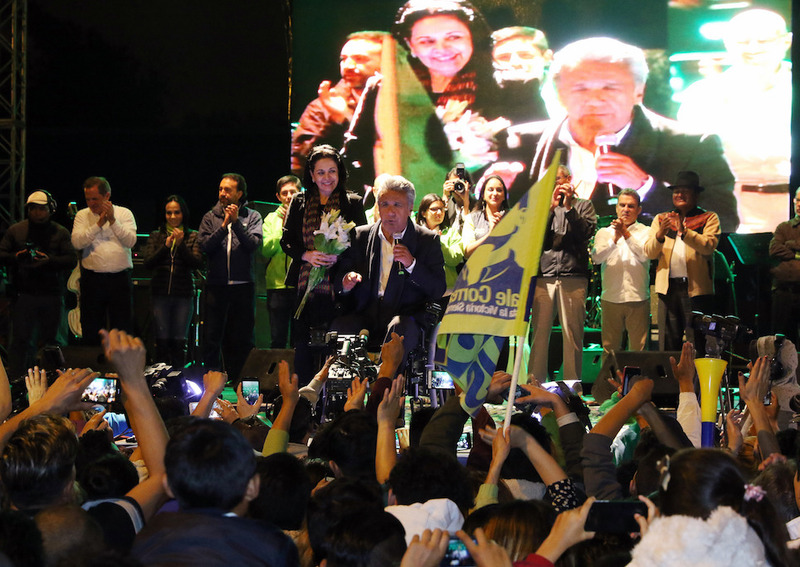 Even with Lenín Moreno’s presidential victory, the Ecuadorian left is in dire need of reconstruction.